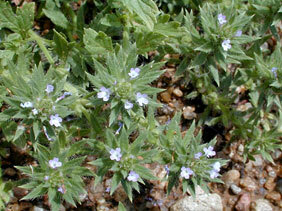 Also Called: Bigbract verbena, large bracted vervain. Stems: Generally several from base,widely branched, prostrate or decumbent, rarely erect, 4-25 inches long, stiff-hairy. Leaves: Opposite, numerous, simple, lanceolate to ovate-lanceolate, .4 to 2.8 inches long and .25 to 1.2 inch wide, 3-lobed or sometimes pinnately incised, lateral lobes smaller than toothed central lobe, surfaces stiff-hairy. Inflorescences: Spike, terminal, 1 to 8 inches long, 2/5 to 4/5 inch in diameter, often ascending, stiff-hairy; bracts 1/3 to 3/5 inch long, 2-3 times as long as calyx. Flowers: Calyx 5-lobed, 1/8 to 1/6 inch long, stiff-hairy; corolla bluish to lavender or purple, 5-lobed, finely pubescent outside; stamens 5, arranged in 2 sets. Fruits: Nutlets 4, linear, 1/12 to 1/10 inch long, yellowish to reddish-brown, each 1-seeded. Habitat: Disturbed sites, waste areas, prairies, overgrazed pastures, lawns, and roadsides; all soil types. Forage Value: Prostrate vervain is rarely grazed by livestock. Uses: The Navajo used a poultice made from this plant to treat centipede bites. Comments: A common weed that will spread rapidly in disturbed areas. Very drought-resistant. The tiny flowers are almost hidden by the conspicuous bracts.